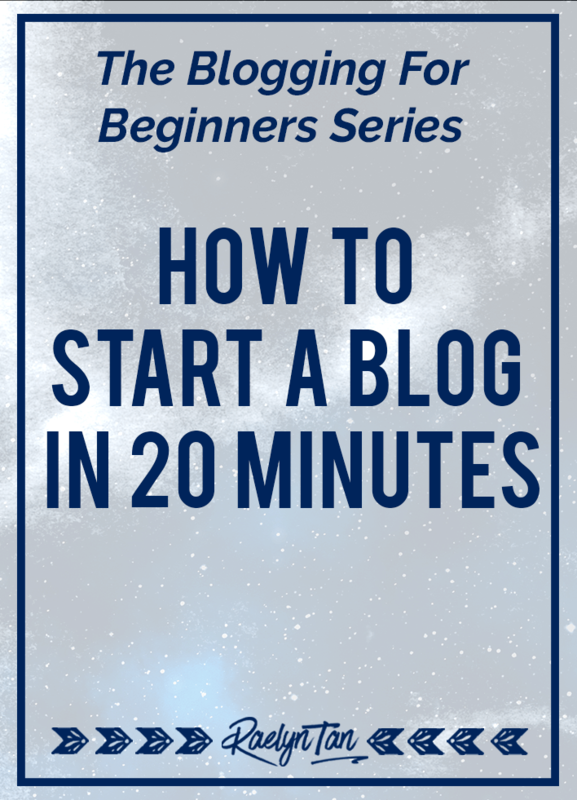 This is part 1 of 4 of the Blogging For Beginners series. Pin me and let’s be BFFs, yo! When you’re small, shared hosting is more than enough for you. You can always upgrade to dedicated hosting when your website is bigger. (Update: I’ve since edited this post to recommend SiteGround. I was previously using Hostgator, but as the years went by support deteriorated, and I cannot by my best conscience recommend anything owned by EIG (Hostgator, Bluehost, a small orange etc) anymore. Here’s the guide I wished I had when I first started. You’ll be up and ready in no time. But first..
Why SiteGround and not other hosting providers? I’ve been using Hostgator (owned by the same company that owns Bluehost) for 3 years, and quite honestly I’ve never had any big issues with them. They were affordable, and I was happy. However, their support, to put it real bluntly, sucked. I still remember, there was once, I waited for their support for so long that I fell asleep on my desk and woke up the next morning! 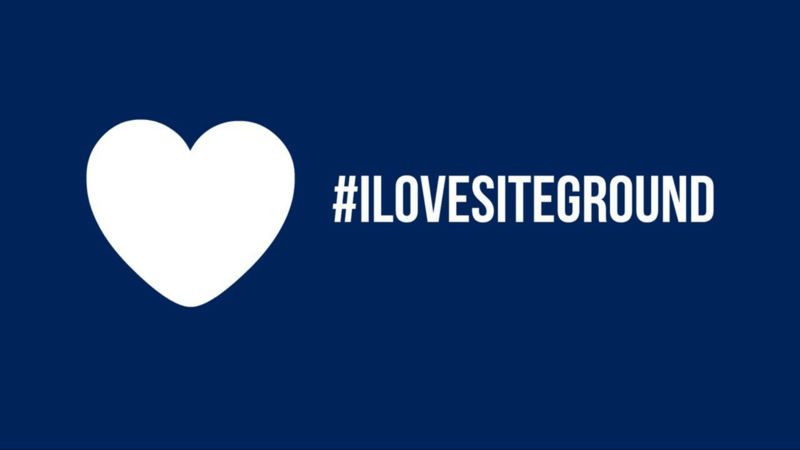 I’ve heard lots of people praising SiteGround to the heavens – and one thing that was repeated again and again was how good their support was. That got me real curious, and I decided to do more research. Hostgator was good. SiteGround is much better. SiteGround is also pretty affordable, if not one of the most affordable hosting solutions out there that’s of good quality. 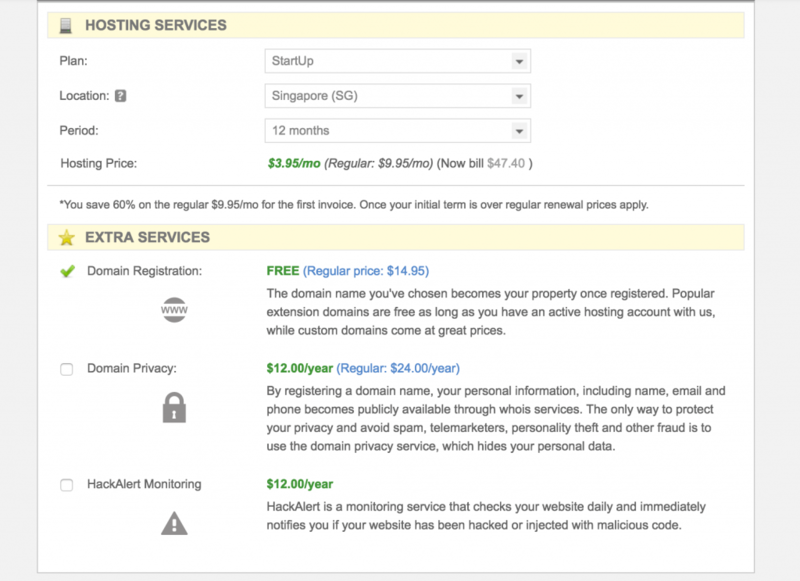 It costs about $3.95 a month, similar to Bluehost & Hostgator. Check out SiteGround here for 60% Off. If you use my affiliate link, feel free to email me at raelyn[at]raelyntan.com if you’ve any questions about signing up to SiteGround and how to do it. It is not owned by EIG. EIG is a company that has acquired many popular hosting companies, and many have said that these once amazing companies have been turned into incompetent companies. Social proof: It’s one of the most popular (if not the most popular) and common hosting provider used by tons of bloggers. 24/7 Support is super fast and great, and not staffed by a bunch of tech idiots! 30-day money back guarantee – no risk! Of course, there are naysayers saying that SiteGround isn’t good and stuff, but I’ve never had ANY issues with my hosting, and you’ll realize that these naysayers are few and far between for SiteGround. SiteGround is one of the better ones with a good track record. They have an amazing live chat. You will be able to reach someone from the SiteGround team SO FAST, you won’t even have time to go and pee. This may seem trivial now, but wait till your site randomly gets hacked or a plugin messes up your website (touch wood! )… you will definitely want someone by your side ASAP. There’s a 30-day money back guarantee if it doesn’t work out for you anyway, so there’s no risk whatsoever! Aka: if you sign up and regret for some reason, just cancel and they’ll give you all your money back. They won’t refund you the $ for the domain name though, but you’ll still need that anyway, regardless of which host you use. Head over to SiteGround and start your blog now (60% off regular price via this link). *If you use my link, feel free to email me at raelyn[at]raelyntan.com if you’ve any questions about signing up to SiteGround/ getting your website up and how to do it. 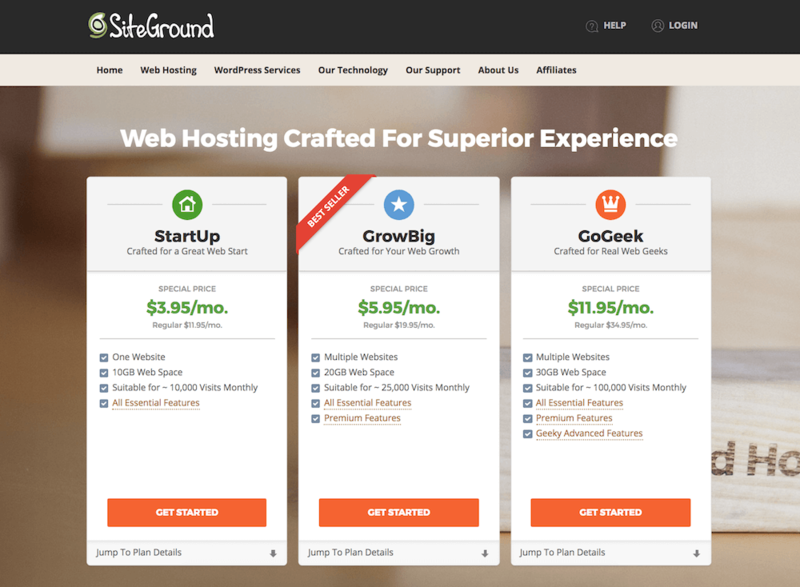 Go over to SiteGround‘s home page, and click on web hosting. Pick the package that’s most suitable for you. There are 3 different plans to choose from: StartUp, GrowBig, and the GoGeek plan. If you’re starting out with a limited budget, then the StartUp plan would be the plan for you. The bestselling plan over at SiteGround is the GrowBig plan. I highly recommend getting the GrowBig plan as it allows you to have multiple websites (at some point in your blogging journey – you will need multiple URLs for course sites, membership sites, community sites and more), priority tech support, free website transfer, and 2x as much web space. I’m on the biggest “GoGeek” plan, which you will need if you have a very busy site that requires a lot of resources. Choose the plan more suitable for your needs. Select, “get a new hosting account,” and then “register your domain.” Write your desired blog URL here. Select your plan, server location and how long you want to purchase your package for. The best server location you can have would be the one that’s closest to where the majority of your blog readers are located. For instance, about ~75% of my visitors are from the USA; hence I would select “Chicago, USA” as my preferred server location. Pro tip: Try to pick at least 2 – 3 years for your hosting plan, if you can. I’m going to let you in on something that you wouldn’t otherwise know. SiteGround’s renewal prices are very high once you become a returning customer, almost 3 times as high! Almost all hosting companies do this – offer a low introductory price and then up the price significantly when you want to renew. First-time customers who are referred like you enjoy a steep discount, so make use of this by choosing a longer duration if you can. For extra services, I did not pick any. If you’re uncomfortable with sharing your personal information online, go ahead and pick domain privacy, or use a PO box address. Bare in mind that if someone really wants to find your personal information they will do so privacy or no privacy. Also, you shouldn’t be using your real address anywhere on the net. Email and telephone numbers are things that are readily available on your blog anyway. The hack alert monitoring will let you know when your site has been hacked. This is a nifty feature provided by SiteGround. Do note that there are other ways that you can monitor your website’s security via other plugins like WordFence, and you can also do regular backups for your website as well! Next, input your payment information, and you’re just about done. You’ll then be sent a welcome email and asked to proceed to the customer area. Click here to sign up for SiteGround at 60% Off. Proceed to the customer area and set up your website. There’ll be a pop-up asking you to install WordPress. Click on “Get WordPress Pre-Installed On This Account” and follow the account setup assistant. Alternatively, you can select “My Account” > “Access My Cpanel” > Under Preinstallers, click on WordPress. That’s your 1-click installation process. Your WordPress admin dashboard is the backend of your WordPress website. You can access it at www.yourdomain.com/wp-admin (just replace “yourdomain” with your URL) and input your credentials. When in doubt, feel free to ask SiteGround’s support. They’ll guide you there. Do you know that many web owners never get around to even publishing their first post? Consequently, 99.99% of these blogs die and fizzle out. Writing your first post gets you in the groove and dramatically increases your chance of following through with your blog instead of leaving it to rot. This is something I recommend to all my clients – get your first post out there ASAP. It increases your chance of success SO much. It doesn’t even have to be a long post! 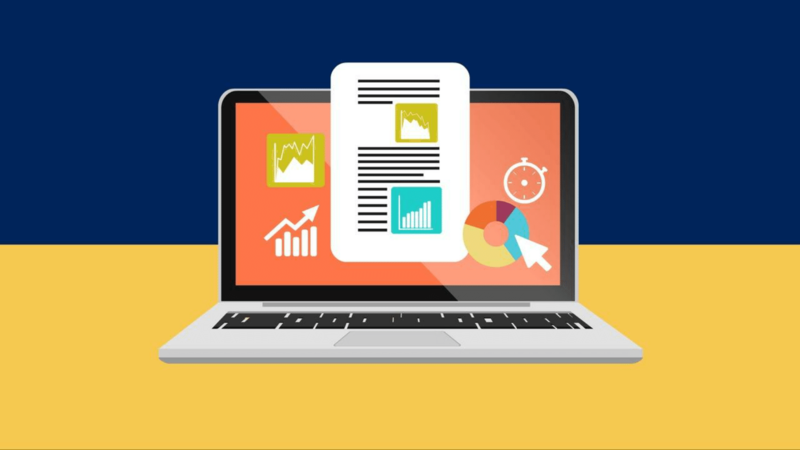 A simple introductory post, along with what users can expect from your website is more than enough for a first post. A theme dictates the overall look and design of your website. Hire a website designer and get real professional from the get-go. For me, I did up my own by purchasing my own website theme. Andddd you’re good and ready to go! 🙂 I hope this has helped. It’s a little technical and may be hard to digest for some of you, but you only need to set it up once, and you’re good for a few years! Depending on what you choose, choosing THE a website theme/ getting THE website design may take awhile, but do not be discouraged. Proceed to part 2 of the series, Can’t Decide What’s The Best Blogging Platform to Use? Answers here. Hey there! Quick question that’s completely off topic. Do you know how to make your site mobile friendly? My blog looks weird when viewing from my apple iphone. I’m trying to find a template or plugin that might be able to resolve this problem. If you have any suggestions, please share. Thank you! Hi Raelyn! Awesome post, really useful! We’ve just launched our website where we give away the best free design resources out there. We’d be stoked if you could add us to this list. Hi Nica, I’ll check that out – thanks! An impressive share! I have just forwarded this to a friend who had been conducting a little research on this. And he in fact ordered me dinner simply because I discovered it for him… lol. Thanks veryyy much for sharing this price worthy info. Hey Wayne, thanks for sharing this with your friend and I’m glad you found this useful! Superb article. I have recently created a article same like your blog about how to start blog. It’s good for beginner who wants to start blog. They need to follow every single step to start blog successfully. Blogging is the good idea to start and earn money online. Very interesting post thanks mate. Hey Ash, thank you for your kind words! Yes, I went to your site and saw your article. I look forward to seeing you around more in my community! Thank you so much for your blog!!!! It has been the most user-friendly information I could find. For a non-tech type, it seemed overwhelming, but have created my blog and feel like I can begin to enjoy the process. Thank you! Thank you for your kind words, Deborah! I just started a blog today and still have so much to learn. Thank you! Working on developing my site now and I must say Raelyn your blogging content is excellent! I look forward to your newsletter. Oh! and hey I sent the tweet. Hey Everett, thanks for your kind words. 🙂 I really appreciate it! But i am kind of an introvert. That is why I am not really sure what to blog about. That is, my biggest problem for me in doing a blog. Any suggestion? Hey Bruce! What has being an introvert got to do with not being sure what to blog about? Do you have any interests? I am a complete and total newby to this, and am wondering why i need both hosting and wordpress, can’t i do everything on wordpress? Great blog! Thx for the info? Just a quick question for a REAL newbie. Do you register your domain via your blog host company? Hey Jane, I’ll leave you with the pros and cons and leave you to decide. Pros: Quick, convenient and you can access everything at one place. Cons: If your host goes bust or decides to troll you, it may not be wise to put all your eggs into one basket. You hit the nail on the head with step #4. I think it is crucial. Just write something. Anything. Even if it’s small to start. I am super new to blogging. But technology makes it way simple to just do it. I write many of my posts on my phone using the WordPress app. This was such a helpful article. I have been wanting to begin a blog and my passion is the topic of organization. What’s been holding me back is worry that I wint have enough great photos to post. When blogging, do you need to only use you own original photos or is it okay to use photos found on Pinterest? For example, if talking about organizing your linen closet, can I post a photo I find of an organized closet or do I need to take my own photo? Thank you for your help. At first, I never knew Siteground would be the best for me. I used Hostgator and I was finding it difficult to verify my account. They had to refund my money. When I headed over to Siteground, I was afraid, but it worked out successfully without issues. Yeah, Siteground’s support is great! Hi, I’m going to choose your “kickstart your blog” $99 option … I’m a bit confused, is that all that I have to spend money on? (I know it’s $3.95 /mo besides that for web hosting) … will you install WordPress then and put the theme on? (What a relief that would be!) Here’s my big question … if I have a question and get stuck while trying to set stuff up do I get an email so I can ask you a question? …. thanks! Hey Elaine, yes you can email me if you get stuck! 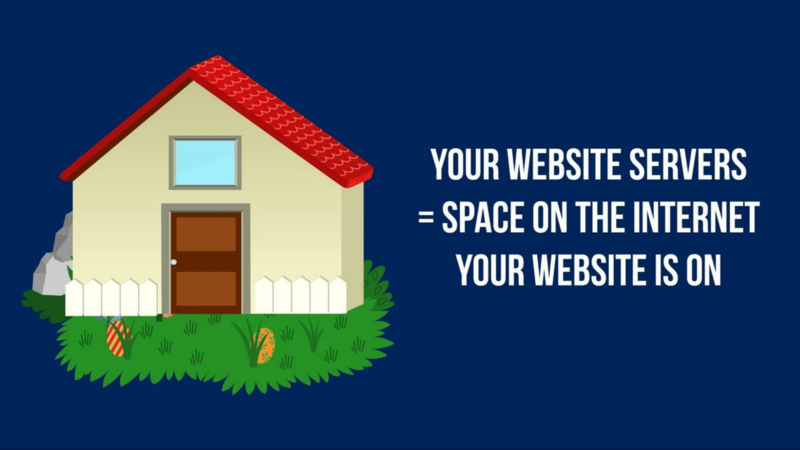 And yeah, that’s all you have to spend on to get your website up. Maybe $10/year for a domain name too? Hahaha. You’ll have to install WordPress yourself (course will show you how), and when you get the theme, you will still have to tweak it to get a design you like. Let me know if you have any other questions! Hi! I have my blog hosted through siteground which i paid for but do i need to pay wordpress also to be able to charge for ads? Hey Kate, no you don’t have to. Hey! I’ve been trying to build a blog for awhile now, yesterday I finially got the guts to do it. I wrote my first blog post and now IDK what to do. I’m using WordPress.com. I can’t seem to find any theme’s that meet my likeings, plus I just have a TON of questions. Excellent blogging tips,i think it’s the best tips for beggeners. dear can you suggest me best keyword research tools paid or free? 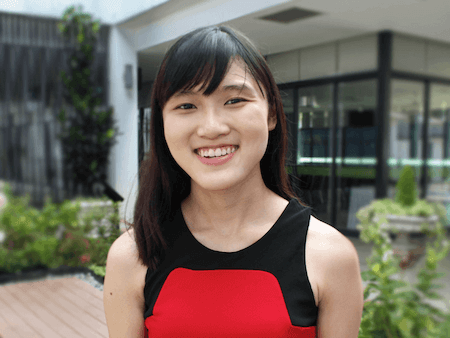 Hey Shaon, check out http://raelyntan.com/kwfinder 🙂 It’s amazing. 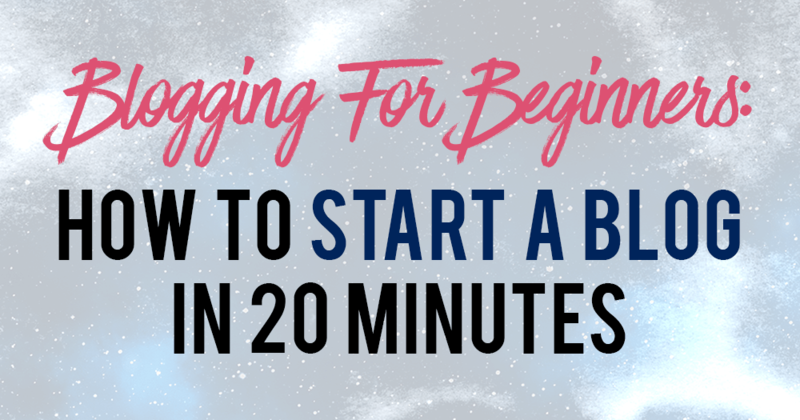 A good guide to starting a blog. Hi there! I’m just starting up my own blog and this post was SO useful! Thank you so much for helping us newer kids, and thank you for the virtual kick in the behind to just write the first post. I’ve been agonising over doing that for a little while now because a lot of blogs suggest that your first post needs to be something SUPER COOL that other people NEED in their lives, etc. etc. So it’s good to hear that the first post can just be an introductory one! This is an amazing article. thank you for sharing it. uowwww, go article. Impressive how good it is. I started a while ago but there are parts that someone else does. You have opened my eyes regarding storage, hosting and siteground I find it very interesting. I’m going to see if I can do it all by myself. Thank you so much for this information. I am very new to all this blogging stuff and have been searching around on how to get started without knowing anything. You lay it out very simply and straightforward. I also like how you explain why you do what you do and use what you use. It helps a lot! Again, Thank You!! Thank you for the blog. It answered some of the questions that have been bugging me for quite sometime. Starting my infopreneur very soon. Hey Julalee! Glad that this helped! Thank you, Leona! Keep in touch! 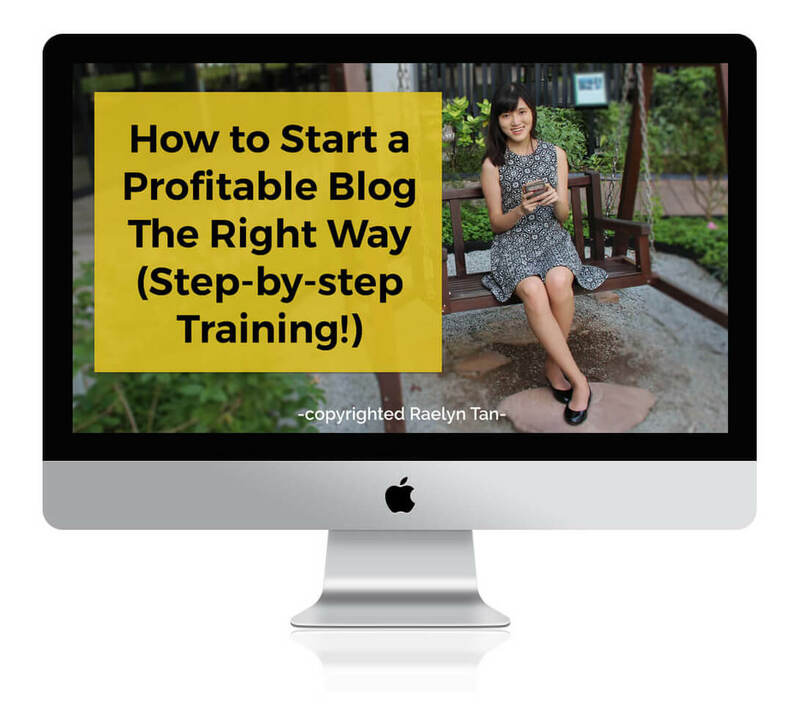 🙂 Now the next step for you is probably to learn how to market your blog and business! I like this post. It is concise and simple. Everybody should blog. It helps you find you purpose in life. Sharing you knowledge is the nicest gift you can give to anyone. We all possess much knowledge. However, we don’t always recognis that fact. Thank you. These series of posts were very helpful! I had started a website on WIX, but have not published it… now I won’t waste my time. I just transfer what I’ve started there to my new site. Good choice! I started with Wix as well, it was a nightmare. Thanks for putting out so much great value. Found recently your site by coincidence. Then started to watch the webinars and finally ended up the “Get 1k subscribers” course. So, why I am posting a comment to “how to start a blog” then? I didn’t want to leave anything on the table. So I’ve already made up my decision to buy the course. Great to see you here, Holger! You’ll love Get 1K Subscribers 🙂 What’s your website? I am an hour into a simple DNS question with Bluehost and they are just not getting it. 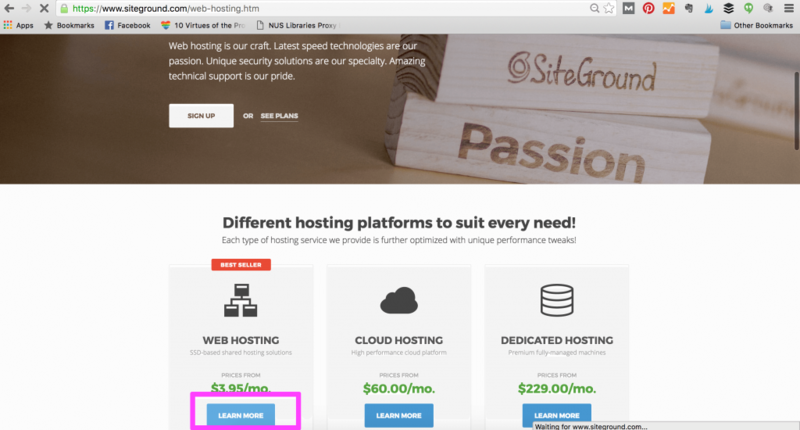 If you are truly a beginner at all of this, Bluehost is not the answer. As we speak, I am cancelling my Bluehost account now. 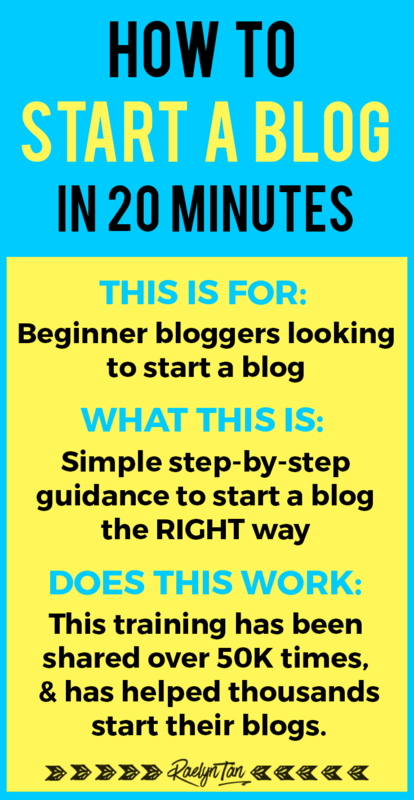 This is the best blogging guide I have come across so far. I have a question. I already have a free blog with blogger and I will like to transfer to WordPress. how do I go about it?